This tube sleeving system was developed by Alfred G. Parker & Co. Ltd., and marketed under the "Parkerifling" tradename early in the Twentieth Century - certainly prior to 1910. The Company was born more than twenty years earlier, in 1880. The firm initially traded from premises in Icknield Street, Birmingham and was joined by Arthur T.C. Hale, who had become manager by 1910, at around which time they moved to Whittal Street. This address became that of the famous "Bisley Works" subsequently stamped on so many of the company's products. 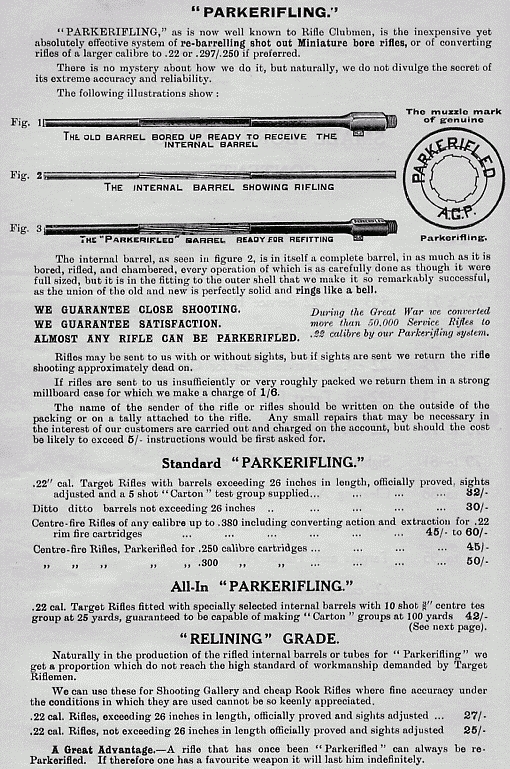 The product range became most comprehensive and included all mannner of especially built target service rifles, sights and ancillaries, imported and other British manufacturers' rifles, cleaning and maintenance paraphernalia, targetry, ammunition and, of course, Parkerifling. A.T.C. Hale became a director at some point prior to 1925. A.G. Parker's son Alfred J. Parker was also working in the business by the latter half of the century's first decade. By 1910, young Alfred was designing aperture sights for the firm and performing remarkably at Bisley with a 'Long' Lee-Enfield fitted with one of his own sights. Alfred served in Belgium and France in the First World War and survived, (unlike John Tippins - son of Luke (L.R.) Tippins , a contemporary armourer, and himself a fine shot), to return to the family business. Prior to 1928, Alfred left to set up his own company; Alfred J. Parker & Co. Ltd. For many years until recently (the business closed late in 2007), the firm was at the "Armoury Works" in Moseley Road on the outskirts of Birmingham city. It was previously at Bath Street Old Schools in Birmingham (the company was still at Bath Street in 1956, but had moved to Moseley Road by the mid Sixties). Here he produced the first Twin Zero rear aperture sight - a folding version.
" RIFLED BY ALFD. J. PARKER". To the right is an image of the muzzle crown stamping. The section through the brass olive used at the muzzle can just be defined. The A.G.P. Parkerifling acquired a superb reputation for accuracy, entirely well founded. The quality of the sleeves was such that the claim of improved grouping over some new rifles was not unwarranted. Even now, rifles refurbished in this way half a century ago will perform to a high standard, such was the quality of steel and workmanship. A tired barrel could be brought back to very useful life with a significant saving over the cost of a total replacement. cutaway of a Parkerifled barrel. The sleeving joint can be clearly seen. The company advertisements often carried remarkable testimonials to their workmanship and the success of their rifling system. Copies of such advertisements published over the forty years between 1925 and 1965 are shown below. They make fascinating reading. 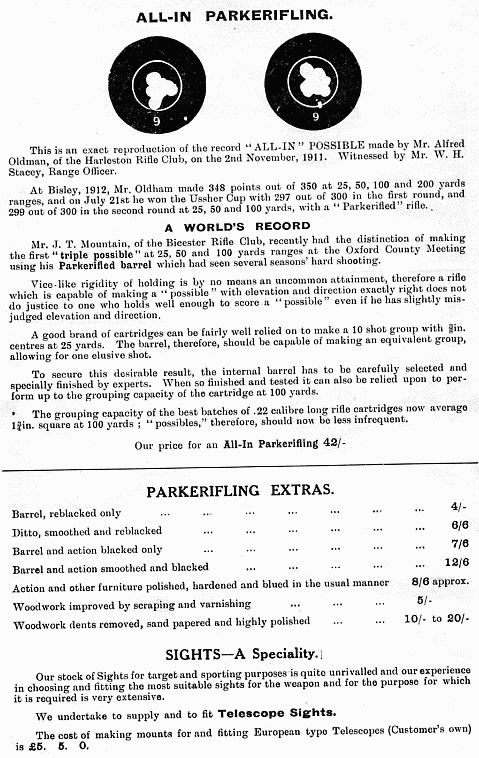 had been done by A.G. Parker & Co.
Not only did Parkers and Parker-Hale offer Parkerifling of rifles, but they also undertook to tube pistols in the same manner. The most common work of theirs was to sleeve existing worn .22RF pistol barrels, but for a period before the Second World War it was possible to purchase a permanently converted Webley Mk.VI revolver. 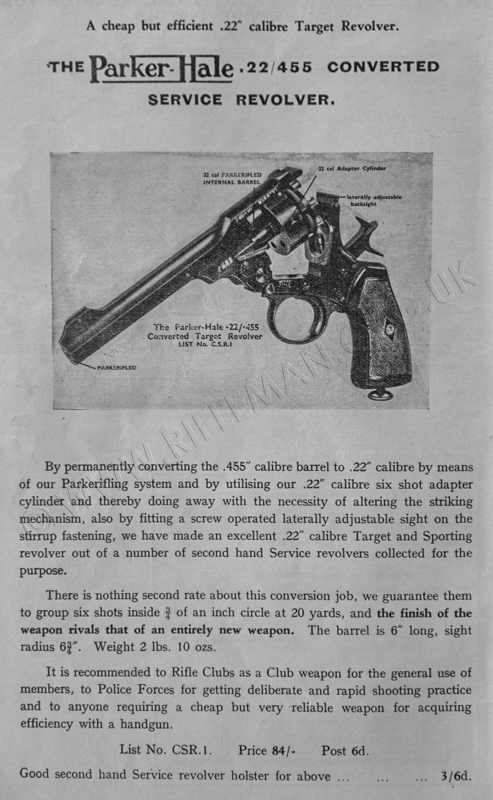 Advertised in the Parker-Hale Service Catalogue of 1939, immediately before the commencement of WW2, the Webley Mk.VI conversion shown above involved solely the sleeving of the .455 calibre barrel, and replacement of the .455 cylinder with the unit normally supplied with the Parker or Parker-Hale .22RF Adapter Unit for the Webley revolver . The rimfire cylinder chambers were positioned in a way that obviated any need to modify the striker or hammer-fall. 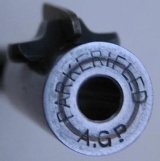 The rimfire percussion offset from centre-fire was effectively built into the cylinder. With the earlier .297/.230" calibre "Morris" adapters and conversions this was not necessary, as the round was already centre-fire. There were also Smith &Wesson .38 revolvers converted by P-H in this way, and one such has been viewed with a milled flat on the right hand side of the barrel, about an inch long by a quarter-inch high - radiussed at each end by the cutter, and the flat engraved with the mark "PARKER-HALE" above "22 CONVERSION". The following Smith & Wesson revolver was available right up to 1954. It was not a "kit" revolver in the modern sense, as it referred to a pistol that would be useful in an "outdoorsman's" kit. Parker-Hale also offered .a 22RF adapter unit for what was still described in the late "Thirties" as the "new" .38" calibre Enfield Service revolver. Permanent Conversion of the Enfield would no doubt also have been possible utilising their .22RF cylinder for that pistol. However, permanent modification of revolvers of the then current Service calibre, with an imminent likelihood of war, may well have been frowned upon. The pre-WW2 Enfield No.2 revolver had a spurless hammer, particularly less hazardous for tank crews, but Parker-Hale only advertised that revolver's adapter on an earlier pistol with a spurred hammer. 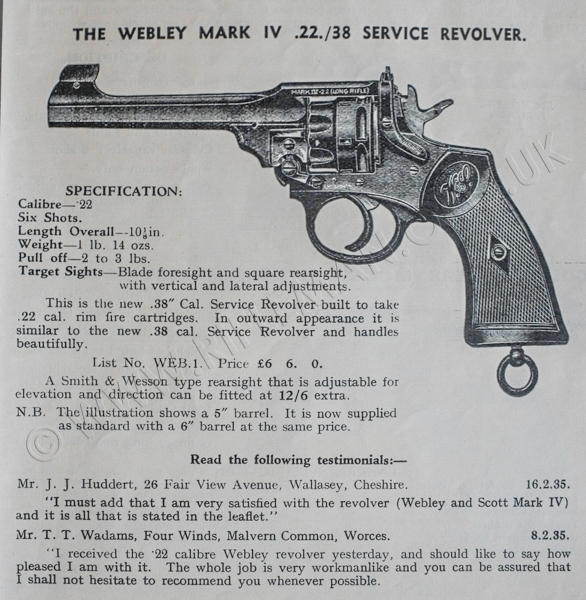 The long availability of the smaller purpose-built Webley Mk.IV revolver in .22 rimfire calibre probably reduced the demand for conversion of the larger Service pistols post WW2. The .38" Mk.IV was originally introduced in 1915, with the company claiming that the pistol had practically the same stopping power as the .455 Mk.VI. An early model Mk.IV has even been seen in the extremely rare .297/.230CF Morris configuration. The later rimfire Mk.IV was obviously not a conversion, but a factory made option; it is worth a mention here nonetheless. The Mk.IV in .38/200 was not initially adopted when the War Office decided between the wars that the large .455" revolvers were of greater calibre than necessary for their purpose. It was considered that .38" calibre was sufficient. Despite the readily available product from Webley, the Royal Small Arms Factory at Enfield embarked upon the production of their own .38 revolver, which was officially adopted in 1932. It was claimed to have been designed by their Assistant Superintendent, Capt. Boys (later better known for his "Stanchion" design - The Boys .55" Anti-Tank Rifle). This was a contentious matter, and, although there had been approved liaison between Webley and Boys, the R.S.A.F. .38/200 Enfield bore overmuch resemblance to Webley's own product for their liking. The resultant court case against the R.S.A.F. was at first thrown out, but compensation was later paid to Webley. Ironically, Enfield was never able to meet the required production quantities of their "No.2 Mk.1" revolver, and Webley produced huge numbers for WW2 issue. 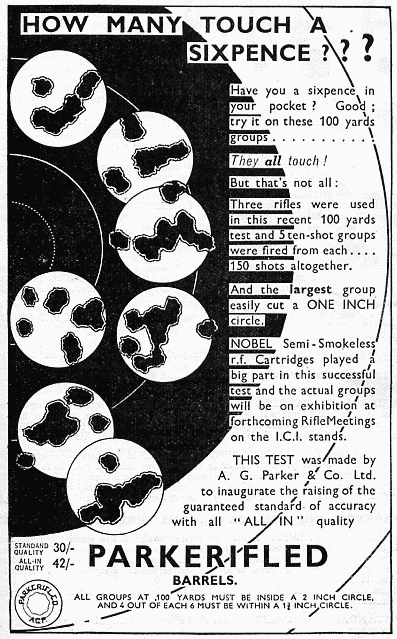 It is interesting to compare the 1939 prices of the various miniature-calibre products. 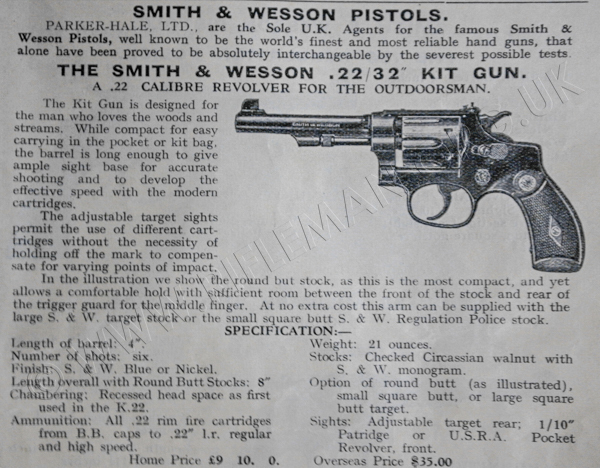 The permanently converted Parker-Hale Mk.VI cost £4:4:0, or four guineas, and the Smith & Wesson more than double that at £9:10:0 - perhaps imported new. The purpose-made Webley Mk.IV in .22RF was six guineas. 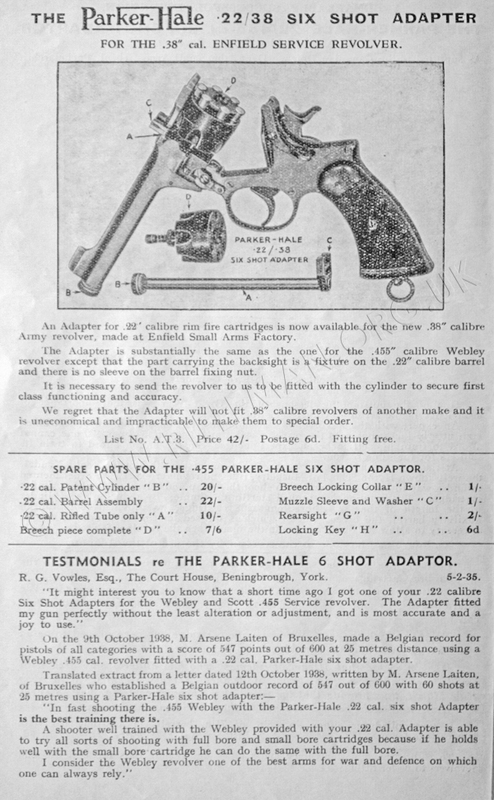 The Parker-Hale adapters provided a far more economical proposition for those already in possession of service revolvers, with the six-shot models for the .455" Mk.VI and Enfield .38/200 each costing only £2:2:0 - two guineas. The single-shot version for the Mk.VI was just £1:16:0. A number of other important Parker products related to small-bore shooting are also accessible from these page links.